Buffalo Bills Beef Jerky is made in the USA by a company called Choo Choo R Snacks, Inc., based out of Lebanon, PA. The company uses only ingredients made in the USA, including beef from cattle born and raised here as well. The company makes several different lines of beef jerky, both in whole muscle and chopped & formed, as well beef sticks and candies. They started out in 1990, and since then have grown to named by Inc. Magazine as one of the top 5,000 fastest growing companies in the United States. 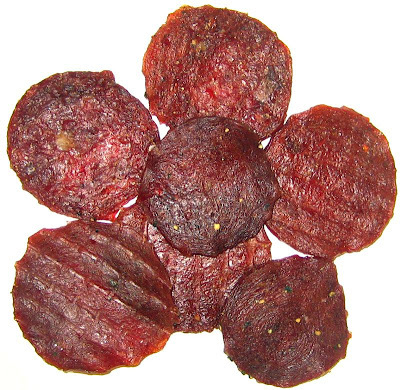 These "Jerky Shots" is a chopped & formed style of jerky, cut into circles, which interestingly, other manufacturers are making as well. I'm not sure what the marketing value is with this; I don't necessarily see this as a kids' jerky, unless this is supposed to be some kind of meat cookie. My guess is that it's kinda like how some salami makers are making salami in heart shapes, so that you can now "give the gift of salami" for Valentine's Day. Whatever it takes to sell meat I suppose. Beef, teriyaki sauce, brown sugar, water, garlic powder, black pepper, onion powder, liquid smoke, sodium nitrite, sprayed with potassium sorbate to protect freshness. There is a sweetness and smokiness that I can pick right away from the surface of these pieces. With some chewing, I can pick up some natural beef flavors, a saltiness, and finally the black pepper starts coming through. For the most part, the taste that seems to dominate throughout the chew is pretty much what I just described above, a combination of a lot of flavors. There's also a garlic taste that I can pick up as well. As for that teriyaki sauce in the ingredients list, I can pick up a teriyaki taste in some of the circles, but in others it presents itself more like soy sauce. Either way, it's not a strong flavor, just enough to show up and make itself known. Some of the pieces have chili pepper seeds on them, though it's not mentioned on the ingredients list. Either way, I'm not really picking up a chili taste, or a hot taste. The natural beef flavors are not strong in this, but it's there. Notice I didn't say "natural meat flavors" but "natural beef flavors". That's because being a chopped & formed product, my guess is that there's more than just muscle in this, maybe some tendon, some fat, some blood vessels, some nose, some hooves. And in fact, what I taste isn't necessarily meat, but who knows what. I suppose that makes these jerky shots more like sausage, since it's ground up beef parts forced into a circular form. But in this case, dried into something like jerky. Overall, these Jerky Shots have a good taste. 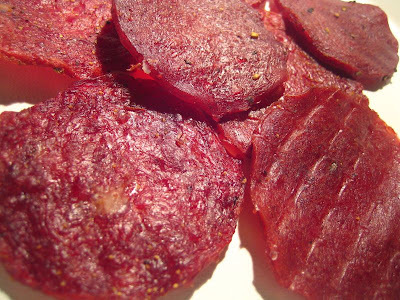 They're packed with a lot of flavor that lasts throughout the chew, and offers a "beefy" taste however you want to define it. Again, this is a chopped & formed jerky, and for the most part it's dry. Yet, it still retains a lot of flexibility. Each piece measures about 2 inches in diameter, give or take a 1/4 inch, and they're cut thin for the most part, but some seem to be thicker than others. The size of each circle is large enough that you can't put a whole one in your mouth, and must bite off about half. However, the circular shape makes it somewhat awkward to tear apart. I think it's because I'm having to tear off a width of about 2 inches, compared to a stick form of about 1 inch in width. If you consider that this jerky is somewhat tough to begin with, tearing requires some work. I found it easier to fold a circle into a taco shape, and then bite off half. Chewing is kinda tough also, but it breaks apart quickly due the chopped consistency. I also found some tiny hard pieces in this, it's hard to say what all it is, perhaps bits of bone, hoof, horn, or maybe even a cow bell. Either way, it's pretty consistent with chopped jerky. Choo Choo R Snacks, Inc. sell these Jerky Shots in a 14oz package, for a price of $14.99. That works out to a price of $1.07 per ounce, putting this one the border between average and cheap. The package claims to include approximately 80 circles. And I actually counted all the circles in my bag, and came up with only 79. For general purpose jerky eating, I'd have to say that this offers a great value. Considering the low price, you're getting a jerky that's packed with a lot of flavor, and more importantly, has excellent snackability, even despite being tough to eat. I found myself wanting to dig into the bag for more. As a black pepper variety, I'd say it provides a good value. There's enough of it there that I can taste it, and after eating several pieces I can feel the mild black pepper burn in the back of my mouth. But it's only a good value because the price is low. I found these Jerky Shots to offer some great flavor that lasts throughout the chew with a complexity of tastes in the teriyaki, black pepper, garlic, salt, and smoky "beef" flavor. While this jerky is going to give your jaws a little bit of a work out, it has an irresistible snackability. But what kept it from getting a higher rating is that it doesn't quite have enough black pepper for my liking, particularly since it's advertised as a black peppered variety. Also, it's still rather tough to tear apart and chew. And then the bits of hard stuff that I kept finding here and there. Finding bits of hard stuff in a chopped jerky is pretty normal, but then that just puts this on par with average. Had it done a better job of living up to its advertised flavor, then I could give this a higher rating based on its complexity of other flavors. The circle concept is a fun idea, but unless they can make the circles small enough eat whole, or if they made this jerky easier to tear apart, it doesn't really add much value to this. But let's be clear on something, this jerky isn't meant to be a gourmet jerky, even though I put it through the same battery of analysis as I would another jerky. This is purely for general purpose snacking, in the same way as you might reach into a bag of potato chips. This is actually a great jerky for snacking. And speaking of chips, wouldn't it be cool if someone came up with "jerky dip" just like with potato chip dip?